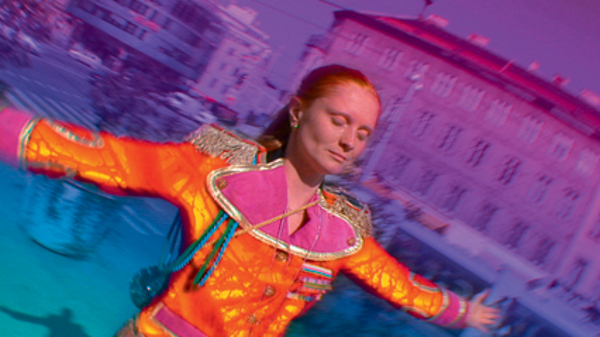 Ewelina Guik does an extraordinary job playing the whimsical strawberry blonde, Pepperminta, who lives with her imagination on her sleeve, longing to make the world see it as she does: in bright kaleidoscope colors.Pepperminta affects everyone she meets, playing childish pranks and singing loudly to get their attention. Once she has it, Pepperminta uses swatches of colored gels to hypnotize them, reminding them that “life is beautiful.” Pepperminta picks up other social outcasts along her way and they become her color disciples with a stomach wrenching menstrual blood drinking ceremony. Together they wreck color-induced havoc on police officers, banqueters, catholic priests, college classrooms and numerous others. Although director Rist is an award-winning multi-media video artist and Pepperminta reflects this talent, the film was too long. The film felt like it was Rist’s first feature film—and it was. Pepperminta would have been much more enjoyable as a 30 minute short .